Here Is Information Over Aquarium plant basics That You’ll Want To Take Note Of. 1.1 Could you recommend suitable plants for a community tank? I am a novice to planted aquaria. 2 What substrate would you recommend for healthy plant growth? 3 What lighting system would you recommend for a planted aquaria, and how long should the lights be on? 4 How should I feed my plants? 5 What is the correct power ratio for your power filter? First, only buy plants that are labelled with Latin names and basic care instructions. If they are not labelled, it is possible they are not suitable as aquatic plants – they could be terrarium or houseplants. If you have the Latin name, you can do your own homework and check the suitability. If your retailer does not know the name, how can he know whether it is suitable? Any reputable dealer will know the plants, and most of the good mail-order companies give good care instructions. Choose plants suitable for your water conditions, and don’t forget floating plants. Could you recommend suitable plants for a community tank? I am a novice to planted aquaria. A selection of easy-growing stem cuttings such as Hygrophila corymbosa, H. stricta or H. polysperma, Wisteria and Ludwigia (especially repens and the green variety). Another plant worth looking for is Heteranthera zosterifolia – all wonderful “cut and come again” plants. They are good for new set-ups as they are inexpensive and fast growing. Others to consider are most of the Cryptocoryne species, such as wendtii and becketii. I also like some of the hardy bulbs such as Aponogeton crispus and Nymphaea stellata, and any of the Crinum spp. Hygrorhyza aristata is worth hunting out as it is one of the only hardy floating aquatic grasses. You could also experiment with some of the slow-growing plants such as anubias and ferns and, of course, Java moss. What substrate would you recommend for healthy plant growth? Please avoid pea gravel or marble chips – a total no, no. They provide no nutrients and are too coarse for root development. My first choice is a good clay-based substrate such as Seachem’s Fluorite or Onyx. It provides a nutrient-rich substrate which acts as a slow release filter. Also, the biological enzyme action of the bacteria that colonise the honeycomb structure enables the roots to convert the minerals and nutrients into a soluble form. It does not compact and is also aesthetically pleasing. Remember to add some bacteria accelerant. An easy way of doing this is to squeeze some gunge from a mature sponge filter. If you cannot afford to cover the whole tank, mix it with a fine quartz or silver sand. This is by far the best substrate for a planted aquaria. If price is a consideration, mix it with 50% fine silver sand or fine silver quartz gravel. Alternatively, have a good layer of the clay substrate with a 5cm/2″ covering of silver quartz gravel. What lighting system would you recommend for a planted aquaria, and how long should the lights be on? are really designed for marine set-ups. These can lead to algae problems. A good combination is Arcadia Tropical and Freshwater. Six to eight hours is adequate, depending on the type of plants and the water depth. Other factors to take into account are ambient lighting in the room. If you only have one tube, the light intensity can be doubled with the use of an enhancer. How should I feed my plants? 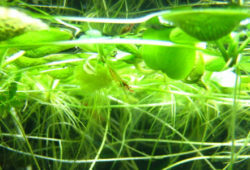 This depends on whether they are true aquatic plants and take their nutrients from the water, such as Egeria or vallis. For these plants, a good general fertiliser such as Tropica’s Master Grow is ideal. For the rest, a nutrient-rich substrate based on clay is ideal and is usually more than sufficient. Plants also benefit from CO2 and you can make your tank CO2 friendly by avoiding too much turbulence as a result of over-filtration. Do not use airstones as these simply oxidise out any nutrients in the water and waste CO2. not overdose and the plants will benefit. You can invest in a more expensive, controllable system later. What is the correct power ratio for your power filter? 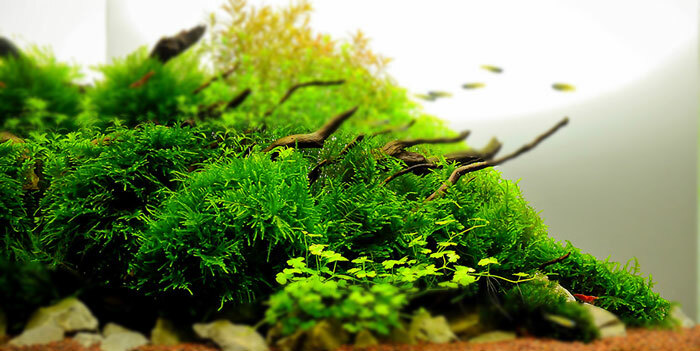 Planted aquaria have different requirements when it comes to filtration. Look for a filter with a slow turnover but a large biological media volume. 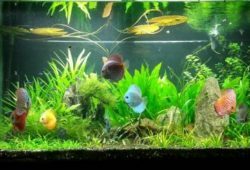 I use recommendations from the free Sera guide How To Set Up An Aquarium which suggest that the filter volume should be 2-4% of the tank volume. The water should run through the filter about three times an hour. Over-filtration and high turnovers are counter-productive for plant growth, oxidise nutrients and wastes money. Your filter should operate for at least four weeks before you have to clean it out. The Dennerle or Juwel internal filters both work brilliantly for planted tanks. 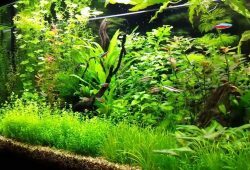 Heavily planted tanks with small or low-powered filters, poor aeration and additional CO2, may be less capable of holding high levels of fish so always stock lightly. This article was first published in the February 2003 issue of Practical Fishkeeping magazine.